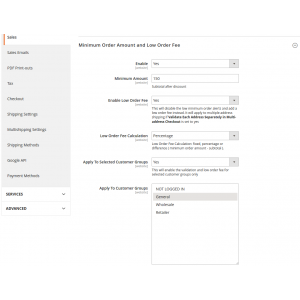 Our Low Order Fee extension allows to setup a fee to orders that fail to reach the minimum order amount in your Magento 2 store. 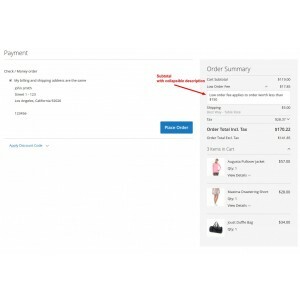 A message will appear on the cart page when the fee is applied and the customer can decide whether to pay the additional fee or to purchase more in order to meet the mimum order amount. 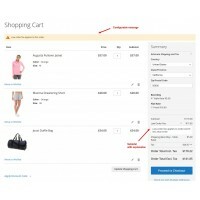 The fee can be set as a percentage, fixed amount, or the amount missing to meet the minimum order amount. 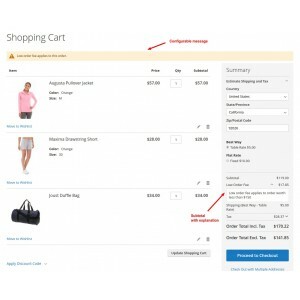 This extension is higly configurable and the site administrator can also disable the fee for certain customer groups and shipping methods. 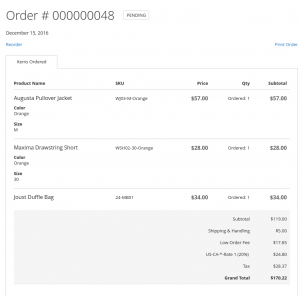 After the low order fee is registered, it will appear in all the related documents: order, invoices, credit memos in all versions: confirmation emails, printable versions, admin panel and PDF's generated in the admin panel. Fee calculation methods: fixed fee , percentage or difference ( minimum order amount - subtotal ). 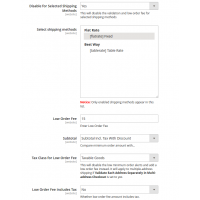 Tax applied to fee : Select the tax class that should be applied to the low order fee. 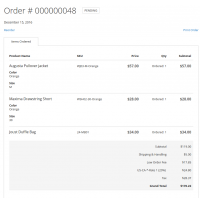 Shows extra Low Order Fee subtotal row in the cart/ order / invoice / credit memo pages, emails and .PDF documents generated by Magento. 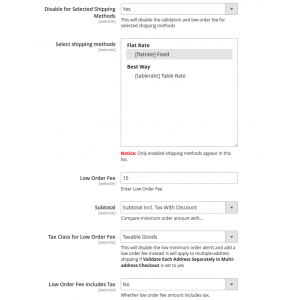 Low Order Fee from Mango Extensions is a "must have" extension for Magento 2 for customers with lot of small orders. With this extension you can simply add a Small Order Fee for small orders. 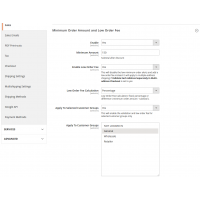 Installing and configuring is easy. 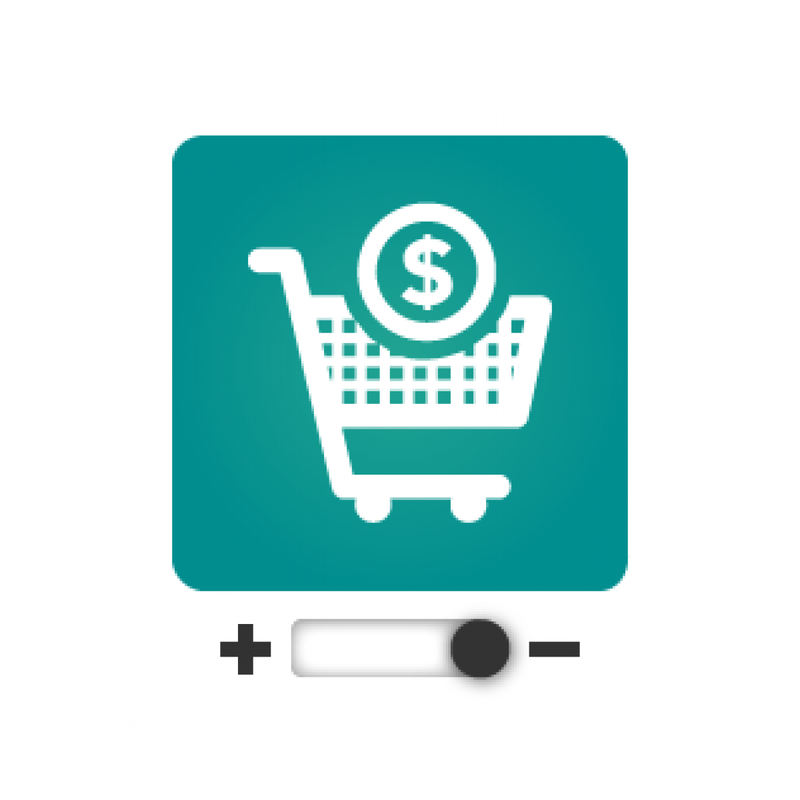 This extension works also great with a 3rd party One Step Checkout extension.